Inspiration from all kinds of sources keeps me focused and this week a friend introduced me to to K.M. Weiland’s blog, Helping Writers Become Authors. 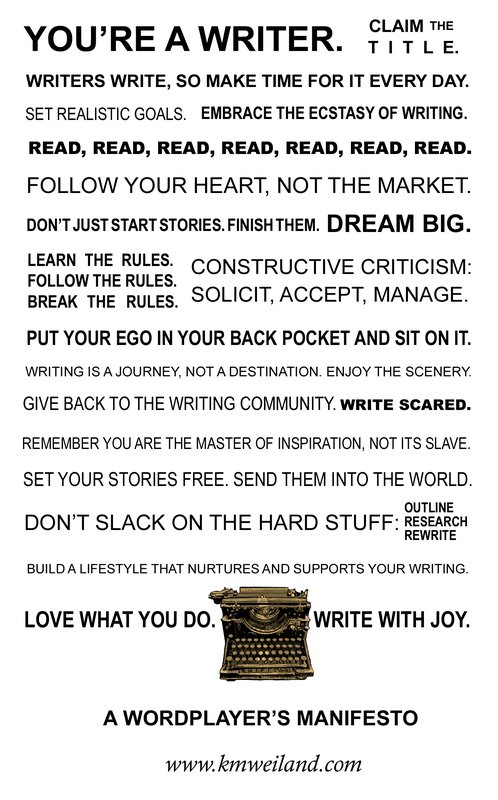 Weiland created the Wordplayer’s Manifesto with her blessings to pass it along on blogs, add it to our desktops or print it out. I’ve done all of those things. I hope it inspires you as well. This entry was posted in Books, Editing Tips, Inspiration, Uncategorized, Writing and tagged Books, Inspiration, Writers, Writing by ltownsdin. Bookmark the permalink. “Write scared” spoke to me. Thanks — this is great!